This recipe is a great way incorporate a variety of vegetables into one dish. It’s also perfect for the end of the week when you have odds and ends left in the refrigerator that you need to use up. The veggies are simply roasted and the addition of sweet honey and mustard results in a one-of-a-kind dish that works well with tons of main course options. Altogether, this is a delicious, low-cost, and vegetarian-friendly side that can be adapted for vegans by omitting the honey. 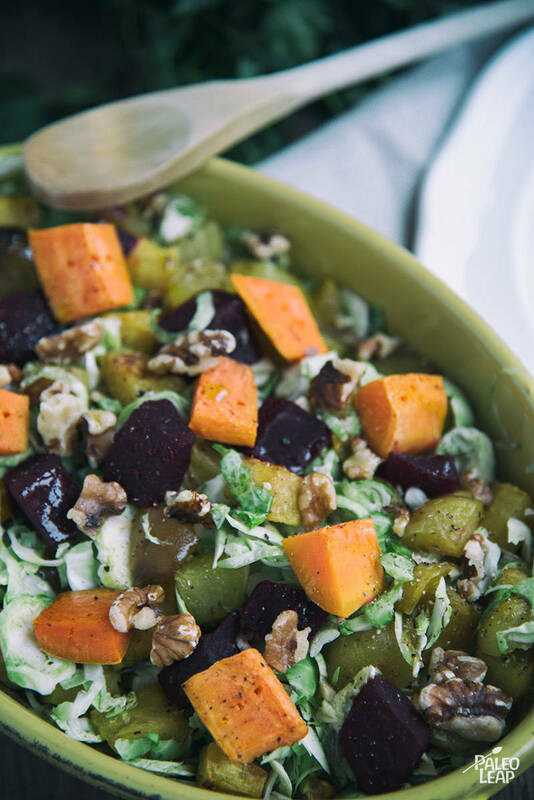 For this dish, you’ll be combining some of the most mouth-watering flavors amongst the root vegetables by including things like butternut squash, Brussels sprouts, beets, and other ingredients. Remember that these veggies aren’t exactly quick to prepare, so if you are still getting used to lots of chopping and prep, this might take some additional time to accomplish. Make sure you are using well-made knives and consider prepping early to save time when you start to pull this meal together. Also, pay attention to these ingredients and how they impact your digestive health – for some, several of the ingredients here may not work depending on your dietary needs. As a side dish, this recipe works perfectly with any type of main course. If you’re pulling together a simpler meal, consider making a slow-cooker pulled beef dish. For a more elegant meal, this side would work perfectly with something like the bacon-wrapped duck with cranberry sauce. In a bowl, combine the beets, potatoes, butternut squash, and 2 tbsp. olive oil; season with salt and pepper to taste. Place on a baking sheet and bake in the oven 30 to 35 minutes. In a bowl, combine the remaining olive oil, vinegar, Dijon mustard, and raw honey; season with salt and pepper to taste. Place the shredded Brussels sprouts in a bowl and top with the roasted vegetables. Drizzle the oil over the salad, gently toss, and adjust seasoning to taste. Top the salad with chopped pecans.